Over the years, I never found myself terribly impressed by store-bought granola. Any time I tried one, it was either too sweet or too broken up or altogether too bland (I suppose that’s what all the sugar was trying to hide). Finally, I found the Vanilla-Almond Granola by Peace Cereals and fell in love. Alas, several years ago I needed to start a gluten free diet, and my newfound love had to go. Very little time passed before I tried to recreate its goodness at home—I’m so happy I did. Making granola from scratch leads to those nice, big, crunchy chunks that are always a favorite. What’s more, this homemade version is incredibly versatile. 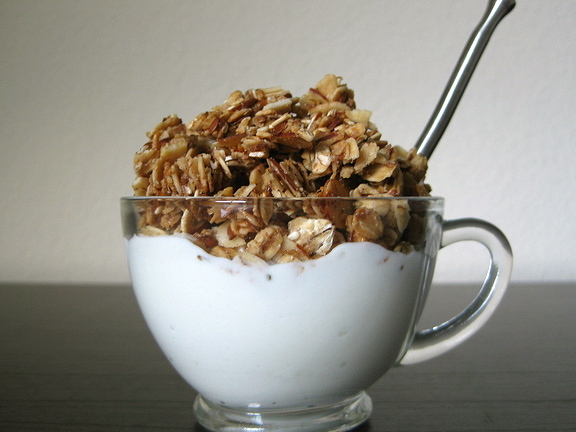 It’s fantastic by the handful for breakfast or a snack, makes for a fabulous addition to plain Greek yogurt, and may be “cut” 50/50 with your favorite cereal (millet puffs or corn flakes work really well) and enjoyed in a bowl of ice-cold milk. I hope you love this granola as much as my family and I do. Preheat the oven to 300°F. Line a large, rimmed baking sheet with parchment paper. Mix oats through fennel seed together in a large, heatproof bowl. In a small saucepan, combine agave nectar (or honey), water and oil; bring to a boil over medium heat. Remove from heat; whisk in ground flax seeds then vanilla and almond extracts. Spread granola on the prepared baking sheet; pack down lightly. Bake until golden brown, about 30 minutes. Transfer sheet to a cooling rack; cool granola completely then break into big chunks. The granola will keep for about two weeks if stored in an airtight container at room temperature, it may also be frozen for several months.